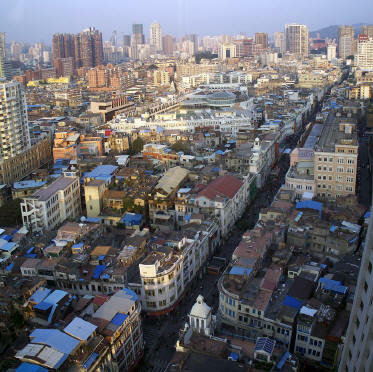 Xiamen (pronounced something like "she-ah-men") had about a million people back in 1985 when Michael first lived here; the 2010 census reported a population of 3.5 million. While this is far smaller than any of the other Chinese cities we've lived in (click here for info), it is still huge by American standards (the whole state of South Carolina has only 4.5 mil and Ohio has about 11.5 mil). (also in July 2012; click here, and look for more photos of the Haiyun campus). 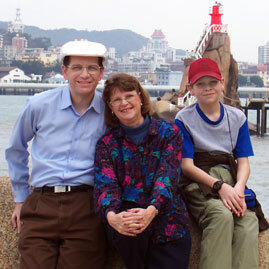 From 1985 to 1987, Michael studied Mandarin at Xiamen University (click to see photos). In 2011, he joined the faculty, teaching English to International Economics and Trade students. This is a photo of the 1000-year-old Nanputuo Temple, which shares one wall with Xiamen University. 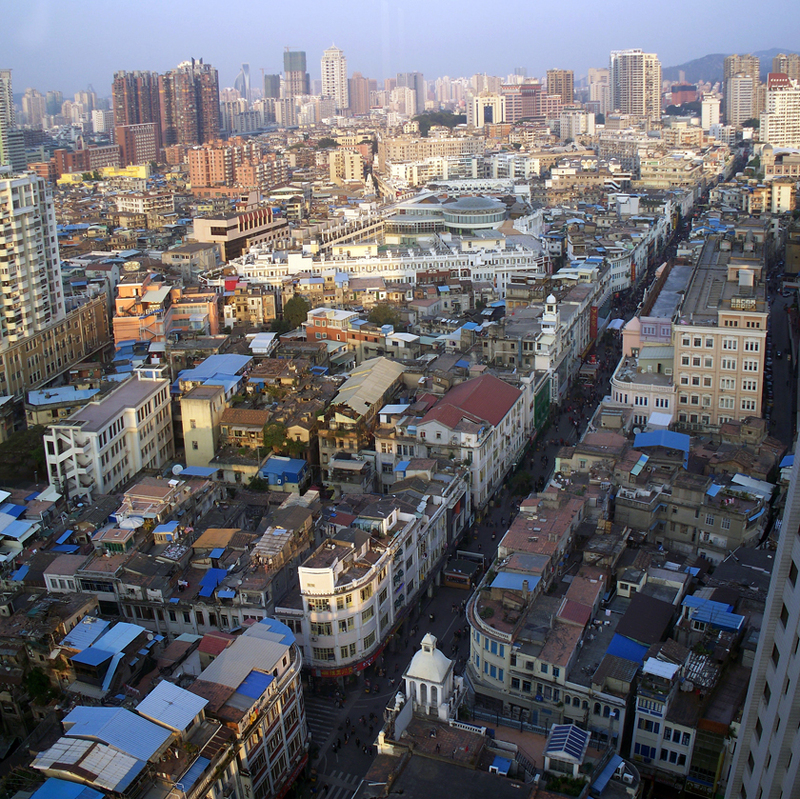 (Above) Vivian, Andrew and Michael in 2004, with the tallest XMU building framed between us (taken from Gulangyu). 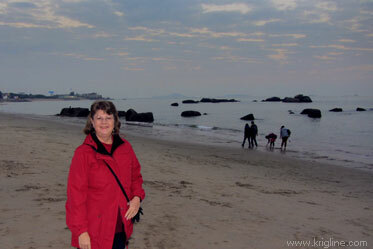 (Below) Vivian on the beach at sunset, New Years Eve 2012.  Click on this photo to see a bigger image. This bird's eye view shows the old "downtown" at our feet, with high rise buildings stretching off into the distance. 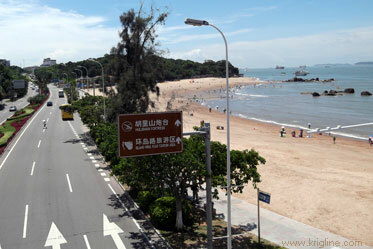 Xiamen has changed a lot since Michael first saw this city, but it still has a lot of charm! Some of the additions include high-rise buildings, McDonalds, Pizza Hut, KFC, Wal-Mart, an Underwater World, and miles of public beaches! 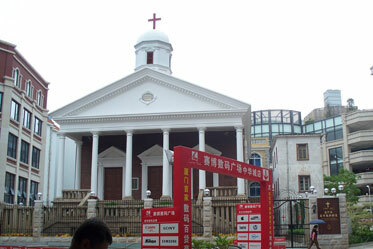 This church in the heart of downtown Xiamen was built in 1848, and the plaque lists it as the oldest Protestant church in China. Fog is common at certain times of the year. 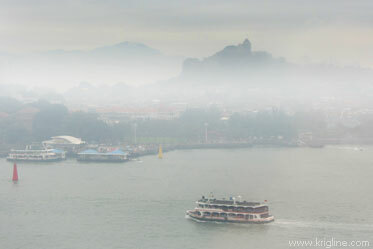 This April 2013 photo was taken from the Indigo Hotel, looking across to Gulangyu "Piano" Island.